A heroic couplet is a form of verse that gained popularity in English poetry and drama during the Victorian era. There were a number of poets and playwrights who have made extensive use of this device, including Willian Shakespeare, John Dryden and Alexander Pope. Geoffrey Chaucer, however, was the first poet who perfected the heroic couplet and used it in Canterbury Tales for the first time in the 14th century. What is the difference between a couplet and a heroic couplet? A heroic couplet refers to two lines of verse that are arranged in iambic pentameter. In order to understand what iambic pentameter is, the phrase needs to be broken down. When two syllables combine to form a word or words and the first syllable is unstressed, followed by the second one which is stressed, it is called an iamb. Pent, on the other hand, means five. So, the term iambic pentameter is a sentence that contains ten syllables, where all the unstressed syllables are followed by a stressed syllable. Two lines of verse that are related in terms of their content and rhyme combine to form a heroic couplet. During the 17th and 18th century, the heroic couplet was one of the most used poetic devices. Many poets attempted it in their poetry and some also used them in their plays. However, there are three pots who have been credited with perfect use of heroic couplet. 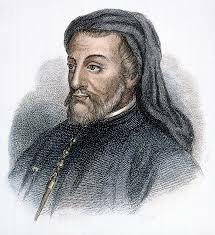 Geoffrey Chaucer composed the Canterbury Tales completely in heroic couplet in the 17th century. After him, Alexander Pope and John Dryden emerged as the most prominent poets during the Victorian era in England. Both these poets mastered the heroic couplet and used it abundantly in many of their well-known works. English poetry has evolved a lot with the social conditions of the country and there are a number of devices that have come up due to which the popularity of heroic couplet has been reduced with time. However, during the Victorian era, it was a very important poetic device and most of the poems that were composed in a heroic couplet discussed the bravery of kings and knights. This became a very important feature of the heroic couplet, and probably the reason why it is called ‘heroic’. A heroic couplet is very crisp in terms of the information that it conveys to the reader. Besides, the arrangement of the syllables in a heroic couplet makes it sound very powerful and grabs the attention of the listener. The way in which Shakespeare has used the heroic couplet highlights the strong effect that it can have. In his sonnets, the last couplet is usually the heroic couplet and it sums up the entire idea of the sonnet to leave a lasting effect on the reader. The popularity of the heroic couplet in 17th and 18 century was a result of the many translations of the popular Latin works of writers like Homer. As these translations flooded the literary scene of England, heroic couplet started to become more popular. However, it was seen that sometimes in these translations, the last syllables of the heroic couplet did not rhyme. This came to be called as the closed heroic couplet and many poets started to use it in English poetry as well. A couplet is a verse of two lines. For a verse to be called a heroic couplet, it needs to be in iambic pentameter. With time, there have been many changes that have been made in the heroic couplet and it has evolved to take a number of forms. The tool has been used in works of prose as well and Vladimir Nabokov has composed the second canto of his novel Pale Fire mostly in loose heroic couplets.